Own an Amazon device with Alexa on it? You can now access my Alexa skill with humorous quotes by famous people by saying, "Alexa, open Humorous Quotes." A great author once said, "Quotes should always be well-stated and said by someone worth saying them." Ok, so I'm the one who said that. Kind of a joke about other sites that understandably limit their quotes to famous people. Decided I would make myself famous here by sharing some of my philosophies, and welcome you to quote me elsewhere -- if online, I'd appreciate a link to this page. Says the artist, "I am the creator of universes. For a universe is not about size, but about ideas. Ideas that take on life in any form, and that entwine with the world we believe we know. And they change that world, and are changed by it, as universes collide. 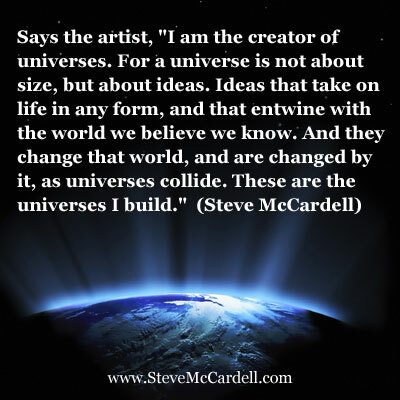 These are the universes I build." If you’ve got terrible service as a business, advertise in the Yellow Pages. No one can review you there for others to see. Otherwise, you’ve got to get online. Conspiracy Theorist: one who believes that people will do corrupt things for money and power. You cannot have a conspiracy without cons and piracy. I will have no regret about death, except that I am so honored to be with those great souls whom I've tread this path with, and I will miss this singular time. Said the atheist when waking up in heaven, "Well I'll be damned." And God, smiling in his infinite love, said, "Only if you want to be." Do infinite things seem finite to the Infinite? Why is it that we so love a recess and so hate a recession? There are those who argue that God is a woman. But did you notice that they never argue the devil is a woman? Some people consider themselves idiots. The rest of us would be lucky to know ourselves so well. Many important people have one mistake in common — that they think themselves important. Internet Explorer is like Old Faithful. You know about it because it’s been around for a long time. And while it doesn’t always blow exactly on time ... it still blows. 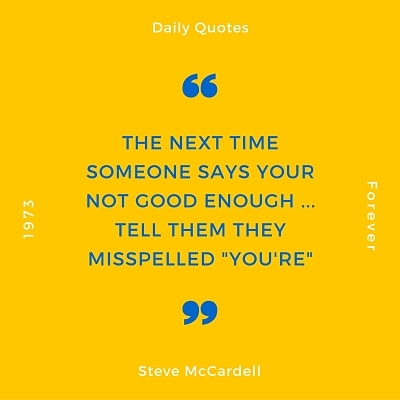 The next time someone says your not good enough, tell them they misspelled "you're." I subscribe to the notion of buying gifts when we see the gift that you just know belongs with a certain person. This transforms the process from an obligation into an act of love. Marketing is relationships. This starts with your relationship to yourself; then with employees and vendors; and finally with customers. The mind is where we wrestle with the devil. We have an occupying force in our nation. We call it the Federal Government. If our government is supposed to be of the people, by the people, and for the people ... then whose government is running our country? We have to stop thinking big government versus small government, and start thinking smart government. 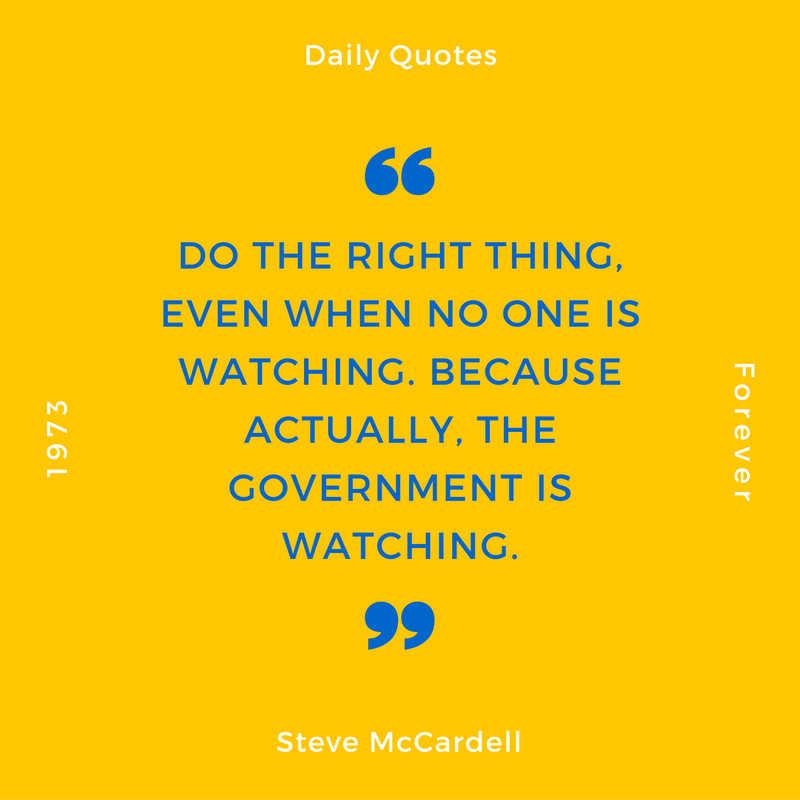 Do the right thing, even when no one is watching. Because actually, the government is watching. False Flag: a terrorist act that the official narrative claims wasn't a false flag, but a terrorist act. The more stuff the unmerrier. Immortality is that which we leave the world through service. While certain tasks, certain uses, might make better use of my life experience than others, no task or use is below me. For if a job is below me, it is below all people and should not be done. There is honor and dignity in every form of useful work. There is right, and there is wrong. And then there is what people think is right and wrong. No two people will agree on the matter, so it’s a damned fool’s mission to try pleasing others. You can only watch the world and ask yourself, 'What makes this a better place?' And then act on that. You might be right. You might be wrong. But you’ll be doing the thing you should. Success is not about what you achieve, but about what you achieve in relation to your potential. Some achieve much, but have the potential for so much more, while others make the most of their personal circumstances in life. Anyone who doesn't think that time is relative never met a Friday. Last to bed, first to rise is good for production, but tires the eyes. If someone states a truth, you can be sure he didn't come up with it, for truth is eternal. We can only come up with stories and lies. We should never admire people for the truths they state, for the truths are not their own. We should only admire their ability to communicate the truth, and live by it, and inspire others to live by it. They say that the Continental Divide is this rift of mountains through the Western U.S. I say that the Continental Divide is this idea that what’s good for the individual and what’s good for the whole are at odds. The entire world is one great family; one great business; and one great government. We simply draw lines around groups to more easily speak of their roles within the whole, just as we draw lines around even smaller parts and call them people. People should never rebel against entrepreneurial wealth, for that is what sustains an economy. They should rebel against fraudulent wealth, for that is what holds people down. Who cares about the book and the sales? The conversations are what make a man large. The quotes are what make him immortal. The important thing isn't your strength in writing, but your ability to inspire change in someone’s thinking or actions, even if that ‘someone’ is only you. Never believe that writing is easy, unless you've done it well ... and it was easy.